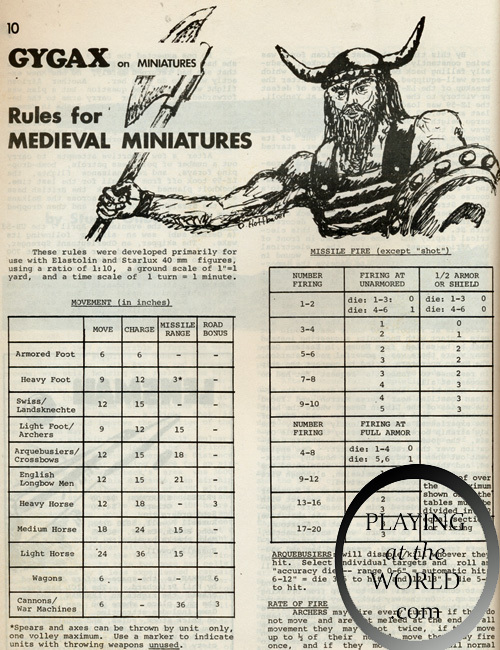 Before the LGTSA Medieval Miniatures rules appeared in Domesday Book #5 - and indeed, right on the edge of the time when the LGTSA came to be called the LGTSA - a set of "Geneva Medieval Miniatures" rules by Jeff Perren and Gary Gygax showed up in the fanzine Panzerfaust, in April 1970. 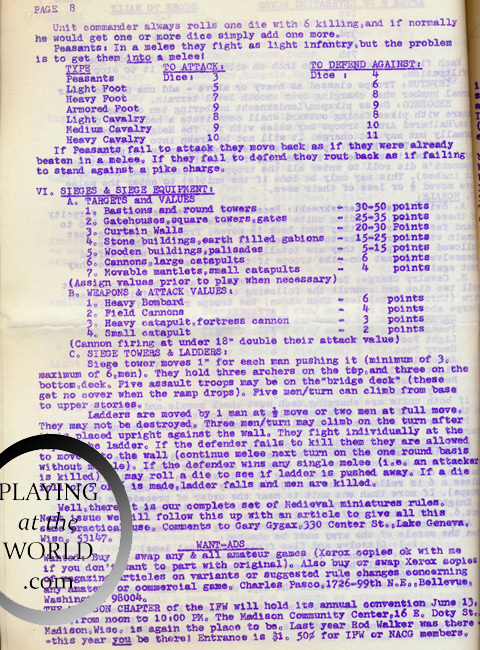 The five pages of rules differ in some particulars from the July version that would surface in the Domesday Book, but, as the introduction to the rules suggest, this transitional publication documents the first step that Gygax took in adapting the local medieval rules for print. The first thing we learn from the Geneva Medieval Miniatures rules is that only "recently" had Gygax and Perren purchased some of the famous 40mm Elastolin medieval miniatures. We know that early in 1969, Gygax had expressed interest in purchasing Elastolin figures compatible with The Siege of Bodenburg, but apparently they did not acquire any until the end of the year. 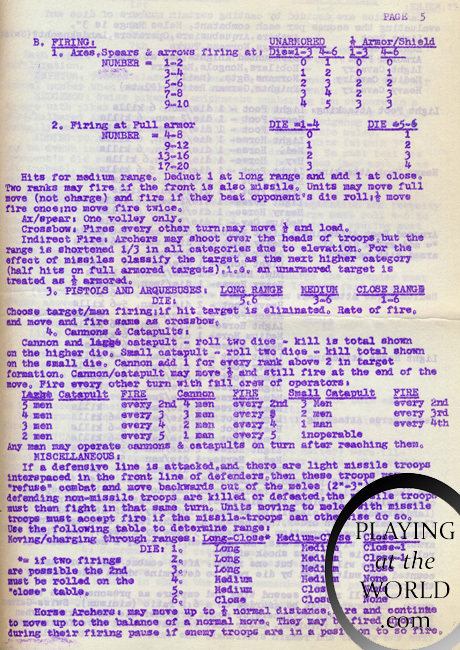 In an accompanying one-page blurb in Panzerfaust, Gygax complains "we have only half of the number of troops we want," and the attached battle report describes an action where about 45 Normans fought 60 Vikings. Prior historical accounts suggesting that these medieval miniature rules had been developed (but not published) in 1969, or even 1968, seem highly suspect. Perren was certainly familiar with medieval miniatures before The Siege of Bodenburg; as early as 1963, he had already recorded collecting them. The core system of the Perren/Gygax rules is in several respects derivative of Tony Bath's medieval rules, the 1966 edition of which was well known in Lake Geneva. 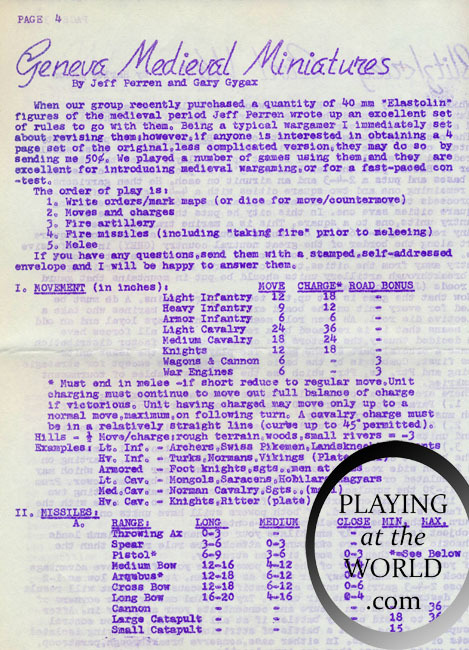 Gygax supplies a brief background explaining that Perren took the lead on the first draft, producing a four-page version which Gygax later expanded into five. Gygax acknowledges that the earlier rules are "less complicated," and thinks well enough of them that he's willing sell them separately. 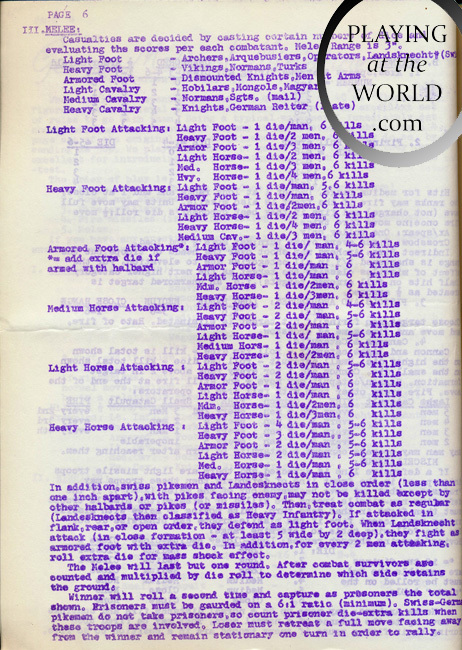 By July, Gygax had expanded the system to seven and half pages in Domesday Book #5. 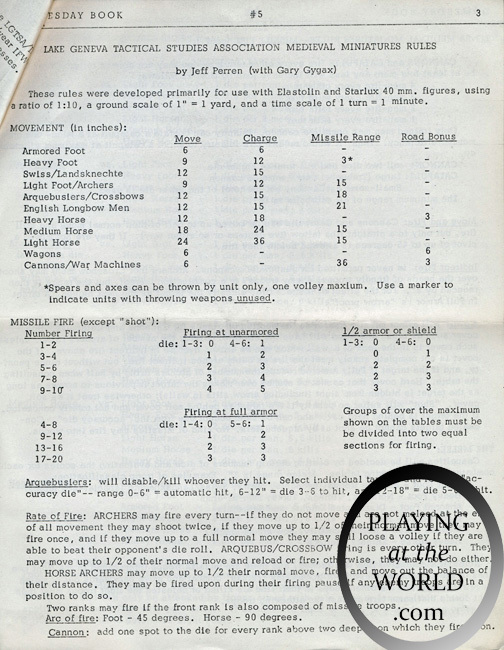 I cover the low-level system differences from the Panzerfaust and Domesday Book rules in Playing at the World (Section 3.2.2.1 and elsewhere); for our current purposes, a few salient differences are that missile ranges play a much large role in the old rules than in the new (a range chart appears at the bottom of the scanned page above), and that the later rules include a special behavior for mercenaries which Gygax appropriated from an article Charles Wesencraft wrote in Wargamer's Newsletter #94. 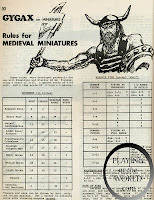 Finally, the LGTSA Medieval Miniatures are reprinted in the August 1970 issue of the Spartan International Monthly. Thanks to a superior layout, they take up only five pages, even with an enormous Viking illustration. There is one omission in the SIM version, namely two missing sentences on the move and fire rules for cannons and catapults. Otherwise, the article is identical to the DB. Ironically, the rules were initially supposed to appear in the July SIM - literally simultaneous with DB #5 - but were held for a month due to space limitations. 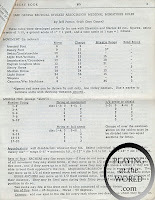 So, by the summer of 1970, the expanded LGTSA rules had appeared in two places. These rules are fairly close to the final form that Chainmail would utilize. 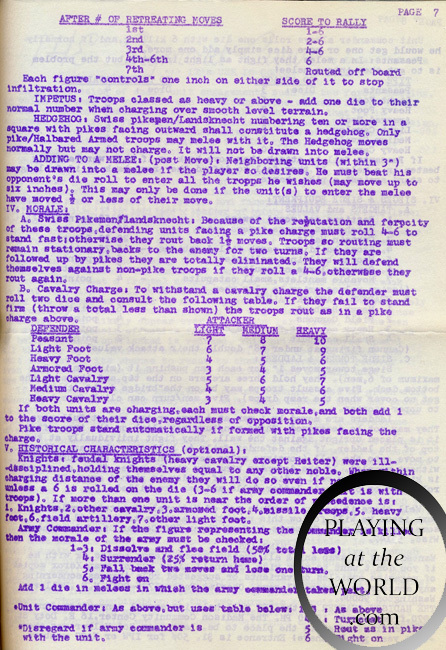 The Panzerfaust rules, however, show a still earlier state of Gygax's development, and merit at least an equal place in the history to the rules subsequently published in the Domesday Book. For further analysis, the rest of the Panzerfaust rules follow here. Thanks for the continuing series. It's tiding me over nicely until your book arrives. I received notice from Amazon that it shipped yesterday. Hey, Jon, maybe I should run these at GaryCon! That would be cool. If you wanted it to be really old school, maybe try to recreate Webster's Gully, Knights vs. Turks. I haven't found any versions of Jeff Perren's version of the rules, before they were edited by Gygax. Do you have any pictures of those?